If you live out close to the airport and are tired of driving into town to get food, try out McKenzie's BBQ. 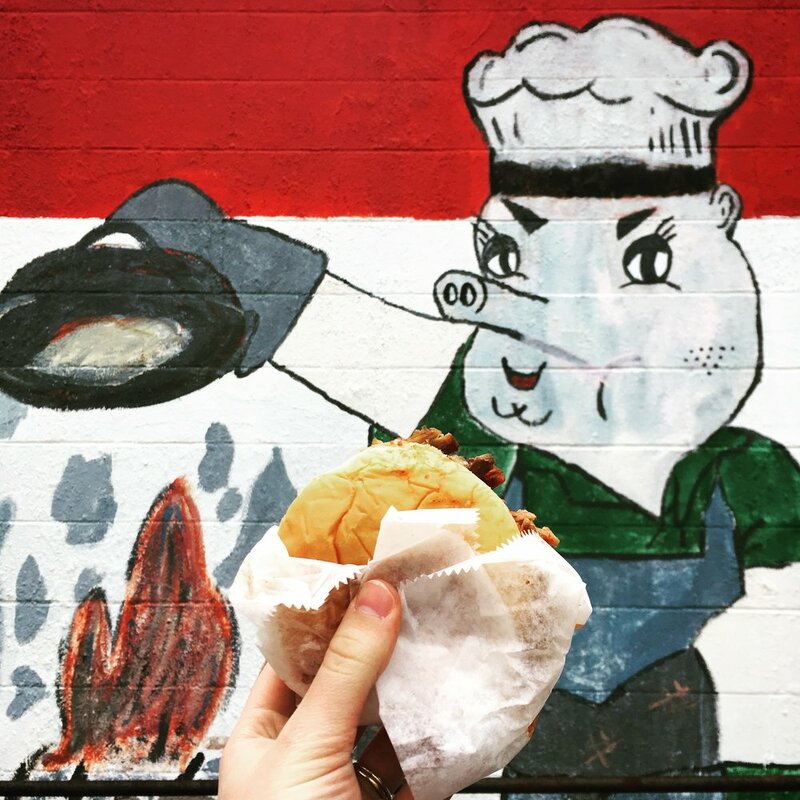 While this spot is best known for their $3 to $5 sandwiches and $7 barbecue plates, they've also got gyros, phillys, burgers, and more for the same price range. DANG. Those are some good shrimp tacos, and 731 Sports Bar & Grill has so much more to offer than that. This new biz offers classic bar grub with a twist, like the brunch dawg, grilled jalapeño pimento cheese sandwich, and burgers like the Titan and Vol. Meals run $6 to $10, and sides like beer battered onion rings and Redskins potato salad are $2 to $4 to add. And make sure to grab a drink at the bar and root on your favorite team in their screen-filled space. If you missed your chance at black-eyed peas for the new year, come get some at Dixie Cafe in the Casey Jones Village! Whether you're craving fried chicken, catfish, meatloaf, or just a good ol' vegetable plate, this spot is sure to serve up a tasty meat-and-three for $6 to $10. Better yet, the cafeteria-style bar is perfect for an on-the-go meal, especially so close off the interstate. Bring on the Media Noche sliders! If you're feeling some Cuban vibes (or just want an excuse to play video games for hours on end), try out E-Gamers Café. Sandwiches and nachos run $5 to $7, or for $10 make it a meal with an Iron Beer Soda, plantain chips, and churros. WHOA. This chicken sandwich is loaded up. Talk about Southern class—if you're feeling some fried green tomatoes, pecan chicken salad, or shrimp and grits, Twist Midtown Grill & Bar is your place. Who knew so many creative drinks, scrumptious desserts, and overall awesome meals were available at our DoubleTree Hotel? Prices range $10 to $18, and don't forget to try their brunch buffet on Sundays! Anybody in the mood for donuts? Try out the recently launched Jackson Donuts on Old Hickory. Just $1 per donut, or get a dozen for only $9! (Anything from sprinkle-covered to old-fashioned, red velvet to powdered.) Or try their muffins, bagels, or breakfast sandwiches for $1 to $4, and don't forget the coffee! You might even get a few donut holes thrown in for free. Bring on the toppings! Not only does Yogurt Square have over a dozen yogurt flavors (think white chocolate mouse, cake batter, salted caramel pretzel), an array of sweet and savory toppings, and eight mix-in syrups to choose from; they've also got lactose- and sugar-free options, all for about $0.50 per ounce. And don't forget to try their bubble tea, smoothies, and gelato for $4 and up. Rain or shine, the folks at Shirley's Bakery ain't slowin' down as they crank out thousands of sweets year-round, from to-go snacks to multi-tiered wedding cakes. While their $1 to $3 iced sugar cookies are our personal fave, they've got dozens of other small treats for under $2, such as fudge, turnovers, and petit fours, not to mention their other cookie flavors like cranberry oatmeal, thumbprint, and butter pecan. Regretting not ordering a custom cake for a special day? Ask them if they've got any ready-made holiday cakes for just $19, but remember, only cash or check! Is there anything more adorable than a tiny pie? If you're looking for the perfect mini sweet to grab this afternoon, swing by The Village Baker at the Casey Jones Village. While this spot is best known for their custom ordered cakes and catered treats, they've got individual fried pies, slices of cake, and fudge ready for you at the bar for just $2 to $4. Be on the lookout as they hope to add items like cake balls and take-home cakes to the shop soon. aIf you're in need of some takeout TLC, try Jiang Jun. Not only do they have Chinese classics like chow mein, moo shu, and mai fun, they've also got plenty of Japanese options like teriyaki, udon, and about eighty different kinds of sushi. 😳 Rolls run $5-$12 and entrees $8-$13, but don't forget their $5-$7 lunch specials that include rice and your choice of soup, salad, or egg roll. 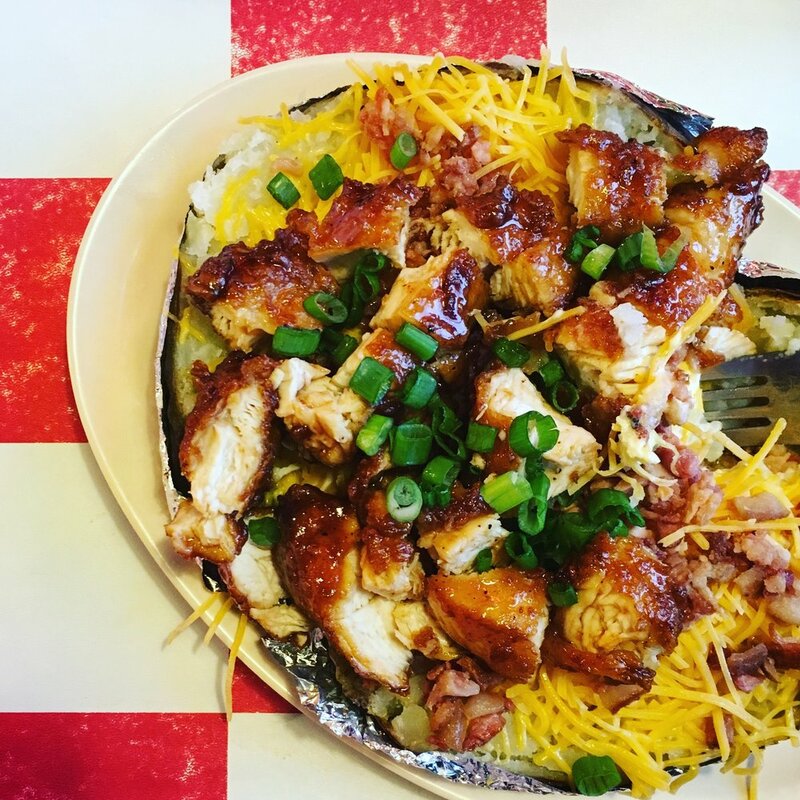 Bring on the loaded potatoes! At Back Yard Bar-Be-Cue, you can get anything from ribs to wings to smoked sausage. Barbecue plates run $6 to $8, combo platters $9 to $11, and the famous stuffed potatoes $5 to $7. They've also got salads, burgers, and some unforgettable desserts, but don't forget to ask about their Sunday buffet, daily lunch specials, and family packs.